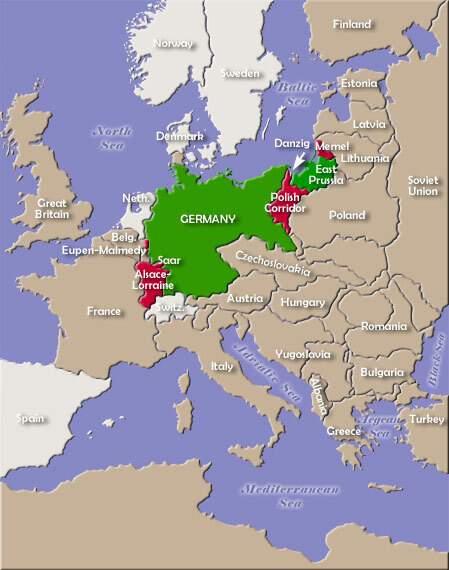 Red areas, discussed below, are those surrendered by Germany under the provisions of the Treaty of Versailles. The districts of Eupen and Malmédy had been part of Prussia, and later Germany, since the end of the Napoleonic Wars. They were granted to Belgium at the Paris Peace Conference for the purpose of enhancing Belgian defenses against possible future German aggression. The Saar Basin, a largely German-speaking area, had long been contested between France and various German states. It became increasingly important in the late 19th century when its vast coal fields helped to fuel German industrial development. The Treaty of Versailles made the Saar an autonomous entity, but France was awarded administrative control and was authorized to exploit its coal deposits. A plebiscite was scheduled for 1935, when the area's ultimate allegiance would be determined. Portions of the provinces of Alsace and Lorraine were annexed by Germany following the Franco-Prussian War (1871), creating a source of great lamantation in France for over 40 years. The Treaty of Versailles returned the area to France. An area known as the Polish Corridor was carved out of West Prussia by the provisions of the Treaty of Versailles for the purpose of giving newly-created Poland direct access to the sea. Inhabited mainly by Polish-speaking residents, the area also contained a large minority of German-speaking peoples. The corridor ranged from 20 to 70 miles in width, but did not include the city of Danzig (Gdask) on the Baltic Sea and several surrounding communities. Germans were to be allowed to pass freely to and from East Prussia. Danzig (present-day Gdask or Gdansk, Poland) was made a Free City by the Treaty of Versailles and was to be administered by the League of Nations. Memel (Memelland to the Germans) had been an East Prussian district on the Baltic coast, but the treaty provisions of 1919 placed Memel under the jurisdiction of the League of Nations, which granted France administrative control. In 1923, Lithuanian troops forced the French out and Memel later became an autonomous district within Lithuania. See general discussion of the Treaty of Versailles.